In the pre-credits title sequence set during the Cold War era in 1967, a manned, orbiting American NASA space capsule, Jupiter 16, was conducting routine functions when a strange, unknown "unidentified object" (another intruding spacecraft, later identified as Bird One) unexpectedly approached, opened its front hatch metal jaws, and consumed the entire US spacecraft. During the hijacking, one of the astronauts during his space-walk maneuvers had his life-line cut and he expired (# 1 death). The fate of the second astronaut was unknown. Radio and radar contact were entirely lost. Subsequently, the Soviet government denied all knowledge of the affair, although the US was quick to blame them. The suspicious US government challenged the USSR to not interfere in its next launch within 20 days, but the British officials were not convinced the hijacking originated from Soviet Russia. The British noted indications (from their Singapore tracking station) that the alien craft landed in the Sea of Japan, and suspected Japanese involvement. Headlines read: "BRITISH NAVAL COMMANDER MURDERED." During a military funeral ceremony, Bond was buried in the Sea of Japan from a British naval vessel. Underwater, his wrapped corpse was intercepted by naval frogmen and taken clandestinely to an awaiting British M1 nuclear submarine. The body-bundle was cut open and Bond was found alive (in a plastic shroud-pouch with an underwater breathing device). 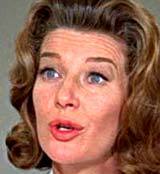 On board, Bond was briefed by "M" (Bernard Lee) after a brief visit with secretary Miss Moneypenny (Lois Maxwell) in the outer office. It was staged to look like Bond had been murdered in Hong Kong, to allow him "more elbow room" to move about undercover during his investigation. "Before the real shooting starts" in a "full-scale war," Bond was to find the location of the base of the renegade spacecraft that hijacked the US capsule, before the next American launch in three weeks. Bond was to be sent to Tokyo, Japan, where he was to be contacted by local MI6 operative Dikko Henderson (Charles Gray). After receiving the code-words "I Love You" from Miss Moneypenny, without deliberately repeating the three words back to her (to spite her), Bond donned a wet-suit and mask, was loaded into a torpedo tube and 'fired' into the ocean, where he swam to the Japanese shore as dusk approached. In bustling downtown Tokyo, Bond was followed as he entered a Sumo hall where wrestlers were preparing for their matches. He was seated in the large audience hall, where his Japanese Secret Service agent contact - pretty, soft-spoken and polite partner Aki (Akiko Wakabayashi) joined him. After uttering the code words "I Love You," she drove him in her nearby white Toyota 2000 GT sports-car to meet Henderson in his Japanese-styled home. The British operative with a wooden leg (lost in Singapore in '42) walked with a cane. Henderson informed Bond about his theories regarding the US/Soviet space crisis, speculating the location of the missile's firing from Japan, and the involvement of a "major foreign power" - but he believed it was neither Russia nor Japan. As he was speaking mid-sentence about the possibility of a "large Japanese industrial concern," Henderson was murdered - he fell forward with a knife in his back (# 2 death). Bond crashed through the paper wall and chased down the Japanese killer outside, stabbing him with his own switchblade knife (# 3 death, # 1 Bond kill). Bond then disguised himself in the dead man's clothes, and approached the man's awaiting car, feigning injury in the back seat. He was driven to the high-rise Osata Chemical & Engineering Company, a local chemical corporation, where Bond was carried over the shoulder of the driver to an executive office and deposited on the couch. When recognized as an imposter, Bond drew his gun, but the brutish driver retaliated. They fought all over the interior of the office, nearly destroying it, and Bond was threatened with decapitation from a Samurai sword. Bond eventually knocked out the attacker with a stone statuette that broke in two from the blow. In a side room where he had stashed the body, Bond noticed a safe door with an open panel, and decided to investigate. With an automatic safe-combination cracker device, 007 opened the safe and stole some documents, but also triggered an emergency alarm. He escaped down an elevator from the pursuit of armed security guards, shot one of them (# 4 death, # 2 Bond kill) and was rescued, fortuitously, by Aki driving by in her Toyota. Bond became suspicious when Aki refused to answer his questions, and then stopped the car and fled into a deserted subway station. As he walked towards her, a trap-door opened in the floor beneath him, and Bond found himself sliding down a slick metal chute. He was deposited in an arm-chair in the secret underground HQ office of the head of the Japanese Secret Service (SIS), "Tiger" Tanaka (Tetsuro Tamba). 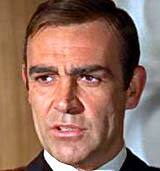 Bond was warmly greeted: "Welcome to Japan, Mr. Bond. It is a great pleasure to meet you at last." When Tanaka examined the stolen documents from the safe, including an order for 500 kilos of butter and 50 containers of lox, Bond hypothesized that "LOX" (a clever cover, meaning American salmon) was also the technical name for liquid oxygen which made rocket fuel. It was possible that Osato, run by industrialist Mr. Osato (Teru Shimada), was surreptitiously supplying liquid oxygen (used as rocket fuel) to an unknown third party client. As Tanaka and Bond traveled in the agent's private train (with a screening room and full service staff), they more closely examined a photograph among the documents and learned from a microdot that an innocent American tourist was "liquidated" for taking an unauthorized photo of a cargo ship (identified as the Ning-Po, registered in Shanghai) near a strip of land. Diving girls were seen, with magnification, in the left of the photo. Bond retired for the night in Tanaka's magnificent ancient castle, where the head agent provided his shared "possessions" - four scantily-dressed female bathing attendants who assisted in a "civilized" bath. After his bath, Bond selected one of the four "sexyful" girls for a massage, although Aki replaced her and promised no interruptions for the remainder of the night ("I think I will enjoy very much serving under you") (# 2 tryst). The next morning, Bond returned to Osato's office posing as Mr. Fisher, the new managing director of Empire Chemicals. 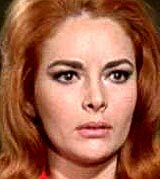 After executive Osato arrived via helicopter, Bond was introduced to his red-headed "confidential" secretary Helga Brandt (Karin Dor), and during their scheduled meeting, it was clear that Bond was recognized as the previous night's intruder. When he departed, Brandt was ordered to kill Bond ("Kill him"), and a carload of four assassins shadowing him opened fire. In another well-timed rescue, Aki saved Bond in her sports-car in front of the building, and radioed Tanaka for support ("arrange usual reception"). Suddenly, Tanaka's two-rotor helicopter equipped with a gigantic electro-magnet swooped down, clamped on and lifted the attacking black sedan into the air and deposited the villains into Tokyo Bay. Bond and Aki watched, from the closed-circuit TV monitor behind the bucket seats of the Toyota, as the gunmen were disposed of (Bond: "Just a drop in the ocean") (# 5-8 deaths). Tanaka then told Bond that Ning-Po was owned by Osato Chemicals, and was presently loading at the Kobe docks, before sailing onto Shanghai. Aki and Bond proceeded there to investigate, where they found liquid oxygen tanks being loaded. The two were promptly attacked by dock workers paid by Osato. As Bond shot three of the men (# 9-11 deaths, # 3-5 Bond kills) and continued to fight them off, he urged Aki to escape. To evade about a dozen attackers, he dove off the rooftop onto the dock, but then he was suddenly knocked out from behind. When he awakened, Bond found himself tied to a chair onboard the Ning-Po, where Helga confronted him in her cabin and threatened him with a scalpel (a plastic surgeon's "dermatome"). He joked: "What's a nice girl like you doing in a place like this?" She kissed him, even while he confessed he was an industrial spy. As she seduced him, he proposed a "nice offer" - convincing her that they could split the profits from the theft of Osato's process for making MSG (worth $300,000), if she cut him free and they fled to Tokyo (and then Europe) together. When she released him, he cut the two shoulder straps on her dress, quipping to the sultry vixen: "Oh, the things I do for England" as they embraced and he unzipped the back of her dress (# 3 tryst). However, as they flew back to Tokyo in a Cessna aircraft that she piloted, the deceitful Helga double-crossed Bond - she sabotaged the plane with a lipstick bomb and jumped out - parachuting to safety. Bond fortunately brought the crashing plane under control, and landed it before it exploded. Upon his return to Tanaka and Aki, Bond was informed that they had identified the remote coastline in the photograph - an island called Matsu, on a direct route between Kobe and Shanghai. It was the Ning-Po's destination for its major cargo that had been unloaded overnight. Gadgets master "Q" (Desmond Llewelyn) delivered to Bond a portable, auto-gyro mini-helicopter packed in four large suitcases, dubbed Little Nellie, for his reconnaissance mission over the island. While investigating the island's extinct volcanoes mid-flight, Bond was pursued by four armed SPECTRE helicopters, but in the dogfight was able to subdue them with his arsenal of deadly gadgets and weapons (# 12-15 deaths, # 6-9 Bond kills). He radioed Tanaka about Little Nellie's conquest: "Four big shots made improper advances towards her. But she defended her honor with great success." The launch of a Russian spacecraft (with two Soviet cosmonauts) resulted in another hijacking by the unidentified vessel with front metal jaws. It subsequently landed back in SPECTRE's rocket base hidden inside a hollowed-out volcanic crater. The Pentagon in Washington, DC was alerted when the Russians blamed the US for the act of aggression, and a war between the two super-powers seemed imminent. The two captured cosmonauts were transported by monorail within the crater. The head of SPECTRE (No. 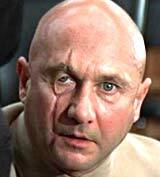 1), megalomaniac Ernst Stavro Blofeld (Donald Pleasence), still hidden although identified by his petting of a white Persian cat, bragged to his Red Chinese funding compatriots about the space attacks. He demanded $100 million dollars in gold bullion in advance deposited in his Buenos Aires account, and was promptly accused of extortion, because their agreement had originally specified that war had to first break out between the US and USSR. Blofeld summoned Helga and Mr. Osato to his quarters, and reprimanded them for failing to kill Bond and allowing the agent to escape. Osato blamed Helga: "I gave Number 11 the strictest orders to eliminate him...She failed." Helga retaliated: "You should have killed him yourself. You had plenty of opportunity." Blofeld pressed a hidden foot pedal as he spoke: "This organization does not tolerate failure," and Helga was plunged into Blofeld's piranha pool filled with voracious fish (# 16 death), intimidating Osato and the two Red Chinese who witnessed the horrible death. He then commanded Osato: "Kill Bond now." Bond was flown by helicopter to Himeji Castle, Tanaka's top-secret Ninja training school and rocket weapons development center. The plan was to infiltrate Ama island and create a base with a hundred Ninjas, who would pose as workers and fishermen. 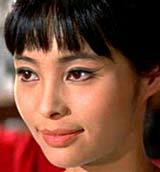 As "extra special cover," Bond was to "become a Japanese," train in Ninja skills, and "take a wife" - not Aki, but Tanaka's own protege Kissy Suzuki (Mie Hama) - an Ama girl who was known on the island. After Bond was transformed and disguised as a "Japanese" by Tanaka's female bath attendants so that he could infiltrate the island near the volcano, pretending that he was a poor Japanese fisherman, he made love to Aki "Japanese style" (# 4 tryst), but during the night as they slept after their passionate love-making, a SPECTRE assassin killed Aki, with deadly poison intended for Bond dripping onto her lips down a long string (# 17 death). Bond shot and killed the hitman (# 18 death, # 10 Bond kill), but couldn't save Aki. During two more days of training, Bond killed one of his training opponents ("a stranger from outside" who had infiltrated into the castle) - who tried to kill him first with a wooden pole dagger-spike (# 19 death, # 11 Bond kill). In an elaborate, formal and traditional Japanese wedding ceremony, Bond married Tanaka's protege named Kissy Suzuki (Mie Hama) who pretended to be his wife, an Ama island pearl diver. They ferried over to the Ama diving island of Matsu, to Kissy's house, where Bond insisted they must sleep together on their 'honeymoon,' but she rejected the idea. He had taken a false name, and it was only a 'business' arrangement, she claimed. That night, as they slept in separate beds, Tanaka informed Bond that the next American mission-launch had been moved forward to midnight - a potential trigger for WWIII if it was hijacked. The next morning, Kissy and Bond slipped away from the fishing divers and investigated a large cave where a local diving girl had recently been found dead under mysterious circumstances. They were forced to evacuate the cave's grotto and swim to safety when it contained poison phosgene gas (and the walls with covered with yellow sulphur). Bond hypothesized that the cave's tunnel led all the way up to the top of the volcano. They climbed to its summit, and took a rest break (Kissy: "It's hard work" - Bond: "Some honeymoon"), and Bond kissed Kissy on the hillside. Then, they observed a descending helicopter, and Bond warned: "the honeymoon's over." They climbed further and discovered that the crater was covered with a false lake surface made of metal - hiding SPECTRE's headquarters and rocket site. Bond entered the site when the crater roof opened (aided by rubber suction cups attached to his hands and knees), while Kissy went back to alert Tanaka and his Ninjas. In only two hours time, the American spacecraft was to be hijacked. When Bond attempted to rescue the imprisoned US astronaut and two cosmonauts, and then impersonate one of the SPECTRE astronauts about to launch, he was apprehended and brought before Blofeld. [Bond had mistakenly forgotten to leave his portable air-conditioning unit behind as he prepared to enter the craft.] The bald, scar-faced, Nehru-jacketed Blofeld made his first full appearance: "Allow me to introduce myself" as he confronted Bond. Bond mentioned how he had lived through a fake assassination attempt in Hong Kong: "This is my second life." Blofeld threatened: "You only live twice, Mr. Bond." Blofeld confessed his evil plan, to "inaugurate a little war" between America and the Soviets, creating a new emerging power to dominate the world. On her swim back, Kissy was attacked by a SPECTRE helicopter, and had to dive deep underwater to evade them. In the film's climactic confrontation, SPECTRE's base was assaulted by Ninja commandoes led by Tanaka, just after the launch of the Bird One intruder rocket. The US was on the verge of a nuclear attack on the suspected Russians. Crater guns opened fire and showered the Ninjas with automatic gunfire (unknown number of deaths). Bond asked for a cigarette (Blofeld: "It won't be the nicotine that kills you, Mr. Bond"), and activated its explosive power, killing one of the technicians (# 20 death, # 12 Bond kill). He fought off others and managed to briefly open the crater roof so that the Ninjas could enter by rappelling in. Although the Ninjas met deadly gunfire as they entered (unknown number of deaths), one Ninja used a limpet mine to blow a gaping hole in the roof of the crater. As the base was being impregnated, Blofeld took Bond and Osato with him from the control room to his secret lair-hideout, where he point-blank shot Osato dead (# 21 death) ("This is the price of failure, Mr. Bond"). He then pointed the gun at Bond, taunting: "Goodbye, Mr. Bond," but a well-aimed metallic Ninja throwing star from Tanaka hit his arm and deflected his weapon, and he was forced to escape in a monorail car. Bond raced to the "exploder button" in the control room through a back entryway, to destroy the Bird One intruder spacecraft, but first had to kill one of the armed guards (# 22 death, # 13 Bond kill). He then confronted and fought against Blofeld's brutish blonde bodyguard-assistant Hans (Ronald Rich). They struggled together on the bridge crossing over the piranha pool. Bond flipped Hans over his shoulder (after a missed punch) directly into Blofeld's piranha fish-pool tank, filled with voracious piranha fish (with razor-sharp teeth) (# 23 death, # 14 Bond kill). As Bond looked down at the feasting fish, he quipped: "Bon appetit." In the flaming control room, Bond activated the self-destruct switch with Hans' key and exploded the Bird One just five seconds before it reached another American craft - he had averted WWIII. Meanwhile during his escape, Blofeld activated the base's explosive self-destruct system, killing more of Tanaka's Ninja fighters (unknown number of deaths), and himself (unknown?). As the volcano's base was destroyed by a series of explosions (while the volcano was also erupting with lava blasts), Bond, Kissy, and Tanaka (and surviving Ninjas) fled for their lives by swimming out of the cave tunnel. Support planes air-dropped rubber dinghys for the survivors, and Bond and Kissy found themselves in one of them. Bond reminded Kissy: "Now, how about that honeymoon?" - she replied: "Why not? But they'll never let you stay." He vowed they wouldn't be found ("But they'll never find us"). They embraced and kissed (# 5 tryst), but "M's" M1 submarine interrupted their love-making, by ironically surfacing directly under their raft. Miss Moneypenny was pleased to have to summon Bond below to deliver a report. The first Bond film to be released during the summer. The first Bond film to be shot almost entirely in Asia. This film marked the first time Bond was seen in his Navy uniform. The first of three Bond films to be directed by Lewis Gilbert, who also helmed The Spy Who Loved Me (1977) and Moonraker (1979). This film had to contend with a rival, unofficial James Bond film, Columbia's big-budget 007 spoof comedy Casino Royale (1967) with David Niven. With a production budget of $9.5 million, and gross revenue of $43 million (domestic) and $111 million (worldwide). The film's title, "You Only Live Twice," was taken from a haiku in Ian Fleming's original novel: "You only live twice. Once when you are born. And once when you look death in the face." 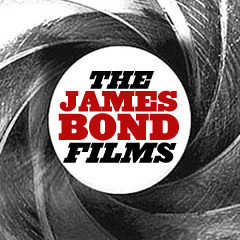 It was notable as the first Bond film with a plot that was significantly different from its source material, Ian Fleming's 1964 novel of the same name, with an original screenplay by noted writer Roald Dahl (the creator of Charlie and the Chocolate Factory, and James and the Giant Peach). The only two similarities to the book were the Japanese location and the Bond-Blofeld conflict. Also, the plot formed the basis of another Bond film Tomorrow Never Dies (1997). Set-pieces: the pre-credits spacecraft hijacking, the fight on the Kobe docks, the mid-air dogfight between Bond's Little Nellie and four SPECTRE machine-gun firing helicopters, and the climactic battle in the hidden volcano rocket base.